Brand Spanking New in the Original Package !!! 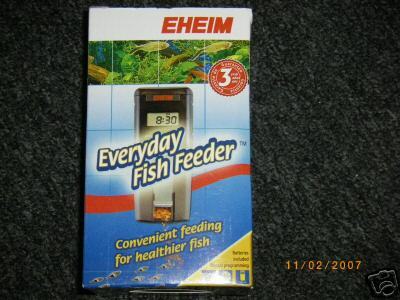 The 3581 "Feed-Air" Digital Automatic Feeder lives up to the Eheim name. Every feature possible is built in to this attractive unit. The electronically controlled programming allows up to four daily feeding cycles of flake or granular foods, with a choice of a single portion, double portions with a 1 minute interval, or manual override. All programmed choices, including selected feeding times, are easy to read on a large LCD/Clock screen. A transparent food reservoir allows for quick "at-a-glance" monitoring of the food level. An integrated ventilator prevents moisture from spoiling food or clogging the feeder, which makes maintenance almost non-existent. This unique feeder uses every last flake in the bin to prevent waste. With a low battery indicator on the cover, you'll know when to replace the two AA batteries this unit needs to run on. This auto feeder will keep you and your tank critters happy for a long, long time. Electronically controlled programming allows up to four daily feedings of flake or granular foods. Choice of a single portion, double portion with 1-minute interval, or manual override settings. 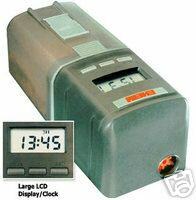 Large, easy-to-read LCD display/clock screen. Operates on two AA batteries, which are included.